"EQUIAIRBAG®vZero is an airbag system inserted in a minimal space like a backpack. It is automatically activated in case of a fall, protecting the spine of the rider. The system is controlled mechanically via a cable that the rider must be connected to the bell of the saddle before setting in motion. thanks to the deformation of the inflatable structure in the moment of impact. " What transposing the rider and the horse in these 80 milliseconds? "To give an idea, a blink occurs in a space of time of approximately 160 milliseconds. The timing of activation of the airbag is really fast. In the moment of danger, the rider does not even realize that the structure is inflated and realizes this feeling only after the fall. We also tested their device to prevent the horses could, somehow, be frightened. Studies have reported very positive results, as even the most fearful horses do not include any kind of disturbance caused air bag in action. " When the air bag is put into operation due to a fall, it can be reused or should be replaced? "Once activated the airbag system can be charged directly by the rider himself in a few minutes without any special expertise. It is necessary to replace the gas cartridge with a new one using the appropriate refill kits. " Talk of studies and tests, the device is then certified? "The airbag protection capability is far superior to any disk protection system. In fact, the airbag system has been designed to meet very high standards as those for motorcycling use. Particular attention was dedicated to the protection of the spine where the injury is still today a major cause of very serious trauma and often irreversible. Equiairbag VZERO mounts the only airbag technology certified EN1621 / 4, which today represents the European standard most prestigious in the field of air bag protection. " This "rucksack" restricts the movement of the rider in the saddle? "The technology is very lightweight and is pratic to be use everyday. Equiairbag VZERO is in one size and can be used by both children and adults by professionals. Its anatomical shape makes it very comfortable and wearable over all types of rider clothing. According to users it is like not to have it, and experience the feeling of more security devoting all the concentration workout or race. 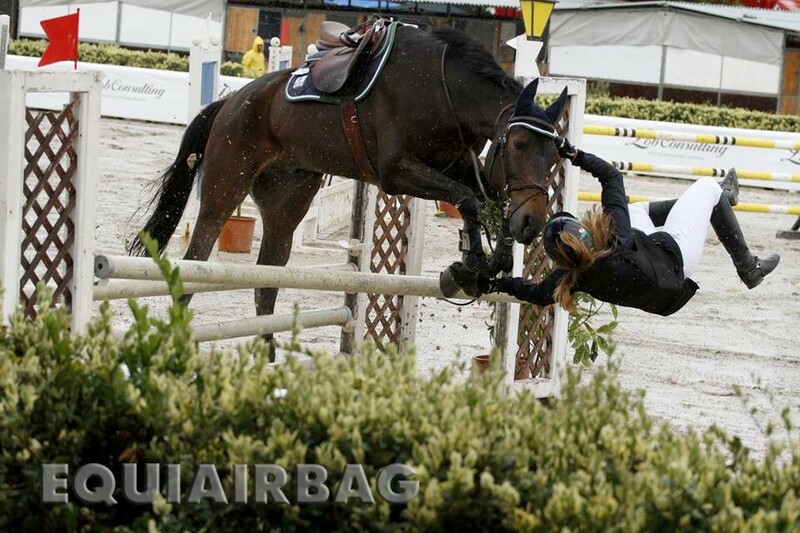 EQUAIRBAG VZERO has long been tested by professional athletes, the three gaits to check as to ensure total freedom of movement necessary to arrive to obtain level results. "